Tag line: "NATURAL or SUPERNATURAL?" 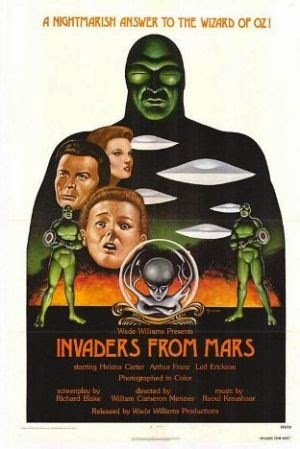 Directed by William Cameron Menzies (who handled the production design as well), Invaders from Mars is a surrealistic alien invasion story as told from a child's perspective. It’s also one hell of a motion picture. The trouble begins when young David MacLean (Jimmy Hunt) wakes up in the middle of the night, just in time to see a spaceship land in the field behind his house. When his father (Leif Erickson) goes out to investigate, he’s pulled under by the aliens (who have burrowed below ground). When dear old Dad returns home, he’s a very different man, with a fresh wound at the base of his neck. David’s mother (Hillary Brooke) soon suffers a similar fate, leaving the boy with no alternative but to seek help elsewhere. Fortunately for him, he crosses paths with physician Dr. Pat Blake (Helena Carter) and astronomer Dr. Stuart Kelston (Arthur Franz), both of whom believe David’s fantastic story. To prevent the aliens from “changing” anybody else, Dr. Kelston calls in the military, which, under the command of Lt. Fielding (Morris Ankrum), sets to work trying to locate the invader's underground headquarters. But the question remains: why did the aliens come to earth in the first place? As he did in The Thief of Bagdad and Chandu the Magician, William Cameron Menzies fills Invaders from Mars with stunning visuals, some earthbound (while looking for help, David rushes into a police station that has an abnormally long corridor, with a large desk situated at the end of it), others from out of this world (the underground caverns created by the aliens are lined with what appear to be balloons, while the spaceship itself is a sterile environment featuring dark lighting and sharp angles). Even more unusual than the film's look is the fact its lead character is an adolescent boy, who, despite his age, convinces an entire town, as well as the United States Army, that Planet Earth is in serious danger. Personally, I found this a refreshing change; in many movies of this ilk, the youngster who witnesses something can't convince a single soul that what they saw was real. In Invaders from Mars, David wins people over to his side fairly quickly, allowing the film to concentrate instead on the military’s reaction to the situation. On the long list of sci fi classics from the 1950’s and ‘60s are titles such as The Day the Earth Stood Still, Forbidden Planet, The Time Machine, When Worlds Collide, The Thing from Another World, War of the Worlds, and Invasion of the Body Snatchers. With a story that’s every bit as frightening as it is original, Invaders from Mars deserves a place alongside these excellent movies. If you’re a fan of science fiction, Invaders from Mars is an absolute must-see.